After yesterday’s neat, precise sort of look it’s time for the rebel in me to come out! LOL! This is messy, rustic and was just plain fun to do. As you can see from the Viva la Verve! sketch below I even left off a panel…and turned the sentiment panel askew too, so the challenge police may be after me when they see this! The paper was made with plain white card stock which was stamped with the various images from the Verve Better with You stamp set. Next came some sponging over a template, followed by some spritzing and finally a thin layer of Distress Crackle Paint. I used a fairly thin layer that resulted in very little crackling. The skinny panel across the top was created by more sponging with a template on some designer paper, more sponging, running it through the paper crimper and finally more crackle paint. The sentiment panel was stamped with the coffee and steam images first, then over stamped with the sentiment, some sponging and finally a little more of the crackle paint. Yes, I’m on a button kick lately…so the embellies were just scattered across the card. Oh, I just love your messy rusticn-ess! 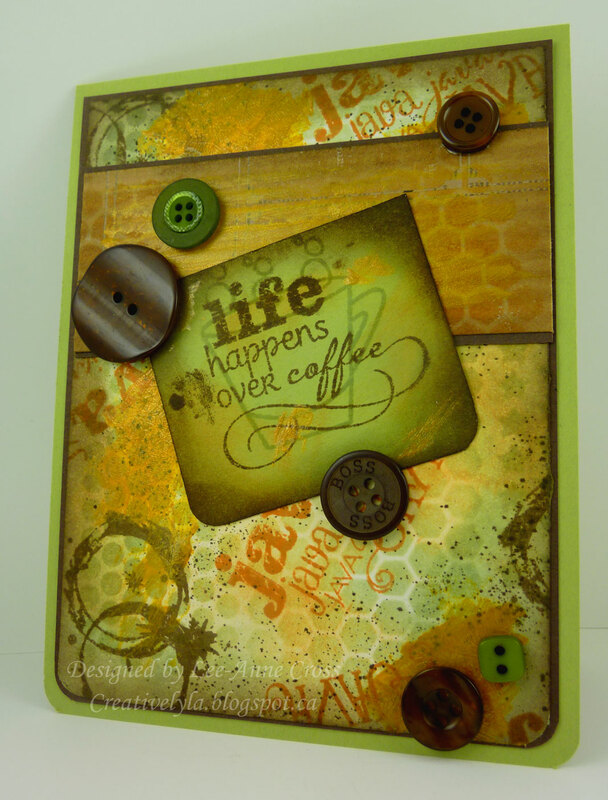 The background you've created looks FABULOUS, and I love those scattered buttons. Beautiful card!